They say a great meal is often enhanced by a good bottle of wine -- cruel, as the effects of a good bottle of wine are often enhanced by not eating any food. Seemingly motivated by that second concern, the veteran restaurant crew behind Anfora. 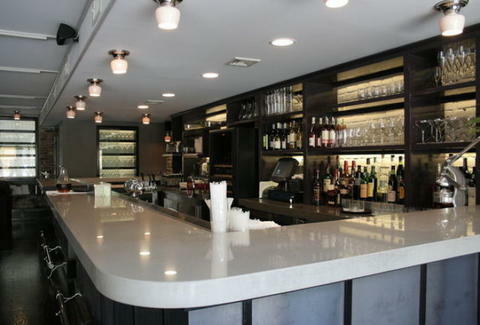 Splitting it's narrow space between a warmly-lit white marble bar (backed by whitewashed brick) on one side and dark leather banquettes on the other, Anfora's a spanking fresh wine bar from the team behind always-packed Italian joints L'artusi & dell'anima, who've jettisoned pasta in favor of med-influenced bites and global wines (no longer the sole provenance of Kevin Smith). The vino's pimped by an extensive list (15+ by the glass) focused on biodynamic, sustainable, and organically produced bottles from all over the world, including eclectic swills like a white rioja from Spain's Lopez de Heredia, and a version of their namesake Anfora (aged in earthenware pots) made by Slovenia's Movia, which is stored upside down and opened in water to help remove the plug of yeast. Yum! There're also seasonal specialty cocktails, including the prosecco-based No Deiss (w/ Riesling reduction and Ramazzotti bitters), the salt-n-pepper rimmed Cucato (organic cucumber/tomato vodkas), the rum/rhubarb/mint Farmer's Friend, and the Purple Pedro: a mix of tequila, cointreau, chamomile, and lavender (as if you needed an excuse to bath in alcohol). To keep you from completely falling over, they'll be plating assorted cheeses, meats from local sausager Salumeria Biellese (sliced at the bar), house-cured olives, paninis, and even lamb ragu sliders -- cruel, as the effects of a good slider are enhanced by being a burger.